This is a part-time position at HIPM with services required primarily on Sunday morning. Have a noticeable growing Christian Faith. CPR and First Aid Certification a Plus. Perform children ministry through Bible stories, action songs, puppet shows, coloring, painting, crafts & arts and prayer. Eligible candidates can apply by sending your resume to [email protected] , only selected candidates will be called for interview. Here are the various volunteering opportunities at HIPM. “Your availability is the greatest asset for us”. If your interest meets the need, why not, go for it! Currently we are looking for volunteers to help us in the following areas. 2. Media/TV ministry, recording, editing, anchoring, etc. These experiences will be a great asset for the students. 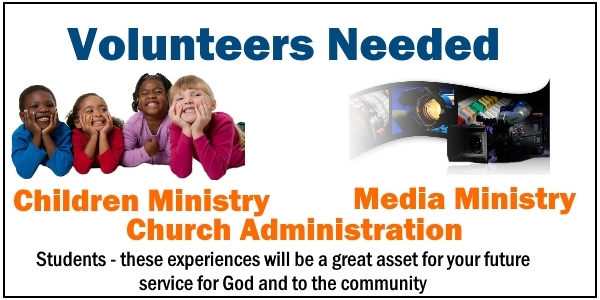 Also for any one who is willing to serve God and the community.